Kevin Spacey's name has been in the news frequently since last October when actor Anthony Rapp alleged that Spacey made unwanted sexual advances towards him when Rapp was just 14-years old. Since then, dozens of men have come forward to share similar stories from over the years, which led to Spacey's firing from Netflix's hit show House of Cards. The show is getting ready to launch its 6th and final season without the veteran actor. Co-star and now main star of the show, Robin Wright, has now spoken publicly about Kevin Spacey's scandal and the effect it's had on the show. 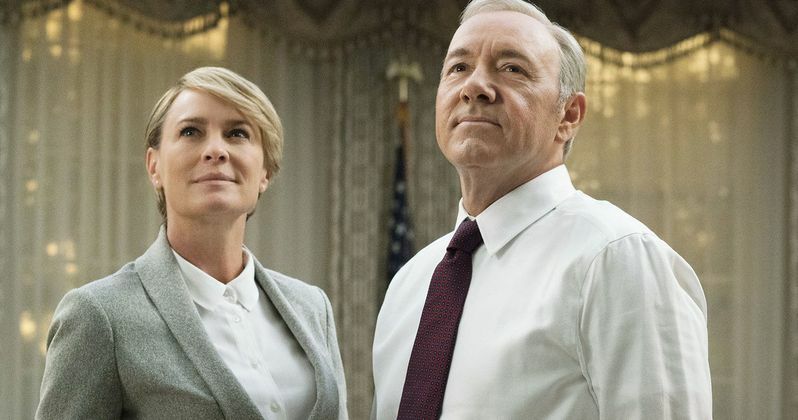 In a new interview, Robin Wright claims that she only knew Kevin Spacey on the set of House of Cards, where they would often joke in between takes. She maintains that their relationship was professional and she did not know the actor outside of work. When asked about her first reaction, Wright said, "I think we were all surprised, of course, and ultimately saddened." Wright then went into more detail. She explains. "I don't even know how to reach him. Kevin and I knew each other between action and cut, and in between setups where we would giggle. I didn't know the man. I knew the incredible craftsman that he is." Guy Pearce, who worked with Kevin Spacey on 1997's L.A. Confidential went through his own personal experience with the actor, still compliments Spacey's acting ability, just like Robin Wright. In the end, Netflix had to fire him from House of Cards, which was not an easy decision to make. However, as the allegations began to stack up, it was clear that the show could no longer go on with Spacey, no matter how great his acting ability is. Elsewhere in the new interview, Robin Wright talks about her own struggles in Hollywood, facing harassment and power dynamics. The actress attributed all of the recent allegations in the entertainment industry to being about seduction and power, which is piece to her own story. While Kevin Spacey and Harvey Weinstein are in the news, it has brought a new attention to the dark underbelly of Hollywood that has been kept secret for so long. Wright had this to say. "This is a bigger, broader issue, I think - which is seduction. I don't care who you are. It's about power, and once you overpower someone, that person then becomes vulnerable. And this last year, I think, has shined a light in a new way to allow us to start a new conversation." House of Cards Season 6 is expected to premiere by the end of this year with 8 episodes instead of the usual 13. Kevin Spacey's Frank Underwood had already returned to the private sector while Robin Wright's Claire Underwood took on the role as President of the United States, so writing Spacey out shouldn't be all that difficult in the end. That being said, it will be interesting to see how long-time fans react to the upcoming final season without Spacey. You can watch a portion of the new interview with Robin Wright via the Today Show Twitter account.